HEATHROW: BERLIN-TEGEL: BERLIN-TEMPELHOF: LISBON: PARIS-ORLY: PALMA: AMSTERDAM: ROTTERDAM: OSTEND: and one more: a delightful scene with a Jersey Airlines Herald and a Derby Airways DC3 that's probably in the Channel Islands, but we can't be sure! 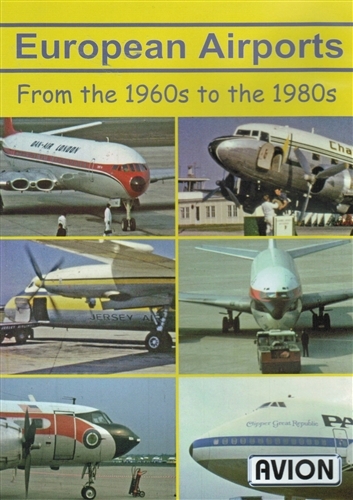 Our ramble round Europe takes in British Westpoint and Aer Lingus DC3s at Heathrow plus many other 60s airliners there, including an Iraqi Viscount. 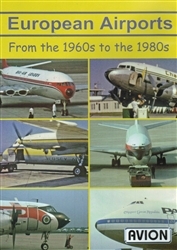 On to Lisbon for Varig and Pan Am 707s, CPA DC8 and various 727s. Then Schiphol, again in the mid-60s, with KLM DC8s, DC9-15s and Electras, MAC DC7Cs, DC3s and CV600 and more. Palma, at about the same time, has a bevy of Britannias; Laker, BKS, BUA, British Eagle and Transglobe, plus more classic jetliners. Berlin-Tegel starts with a Dan Air 707 and an Air France Concorde in the same shot; a hard act to follow, but one managed successfully with a collection that includes: Aeroamerica 720, Air Berlin USA 707s, Mackey, World and Capitol DC8s and lots more. Tempelhof's got Pan Am 727s and BEA Viscounts under its famous roof, in the 60s. Then we return in the 70s for a C97, CV240, 747SP, C5 and more, arriving for the well known USAF open days. An Air Madagascar 707 at Paris, Channel's Viking and DC3 at Rotterdam and of course, so much more; all in color and all (with the sole exception of a Hastings!) with authentic sound. Run time is about 58 minutes. Format is NTSC DVD and region-free.